Offered, as Ganga is offered to Ganga, to the lotus feet of His Divine Grace A.C Bhaktivedanta Swami Prabhupada, the founder-acarya of the international Society for Krishna consciousness, the foremost devotee of the modern age, the spiritual master of the entire universe, and my personal savior and ever well-wisher. 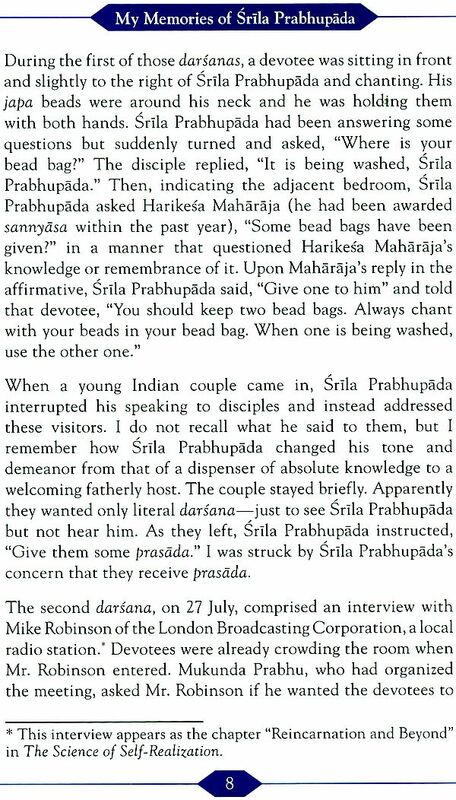 In this edition, few extra details have been added to the biographical portion, and an error corrected: in one anecdote I had named Nanda-Kumara Dasa as the devotee who wore Japa beads round his neck according to other devotees who were present, he was not in England at that time. Also, the section featuring Vyasa-puja offerings has been enlarged and now included all the homages that I have written to date. Vyasa-puja offering have been included largely as they appeared. 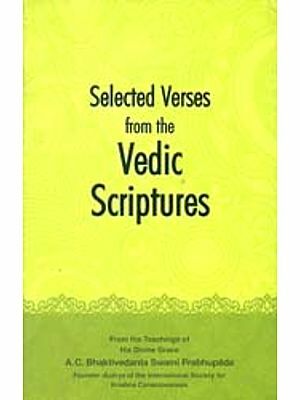 The essay “One Speaking Strongly in Srila Prabhupada’s service” has been omitted (It has been published as a separate book). 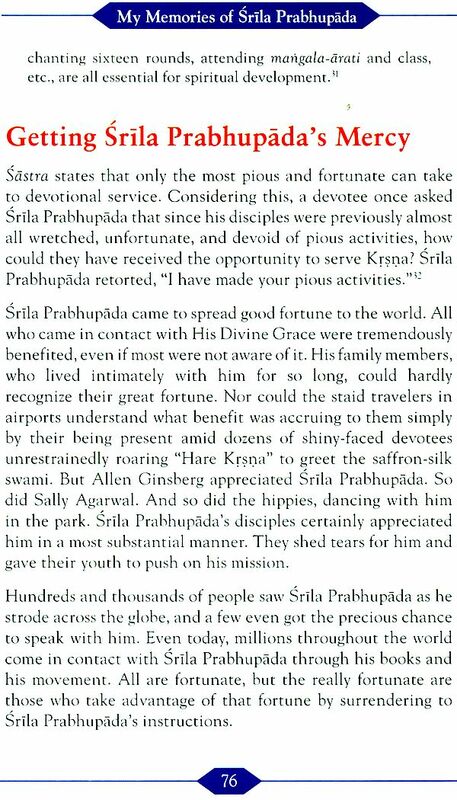 I Joined ISKCON in 1975, when Srila Prabhupada was already established as a great world acarya and had several thousand desciples. 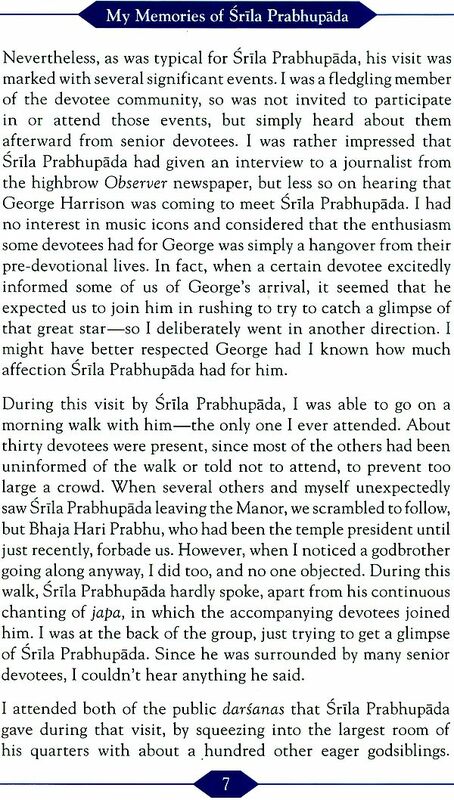 By that time, only a few devotees were allowed regular personal access to srila Prabhupada ; the rest wrer discouraged from disturbing him. 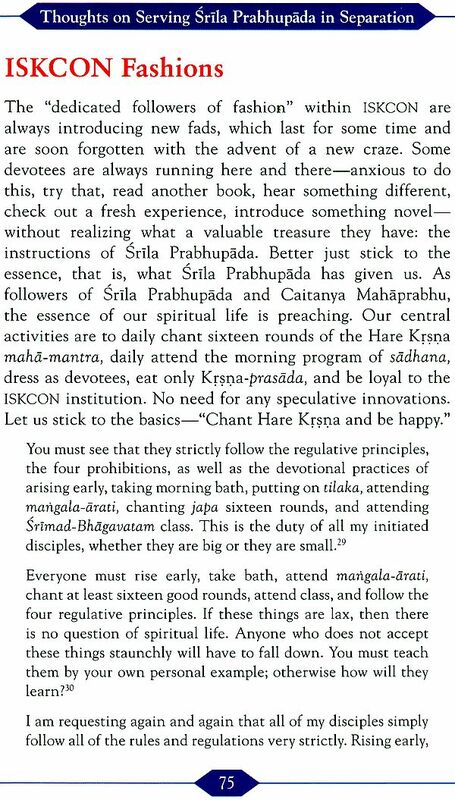 Even while traveling and preaching extensively, Srila Prabhupada set aside as much time as possible for his foremost work: translating books. We were told that more important than seeing Srila Prabhupada in person is to follow his instructions, and that he was especially pleased by distribution of his book. (In those days, most of the brahmacaris wree engaged in that service.) 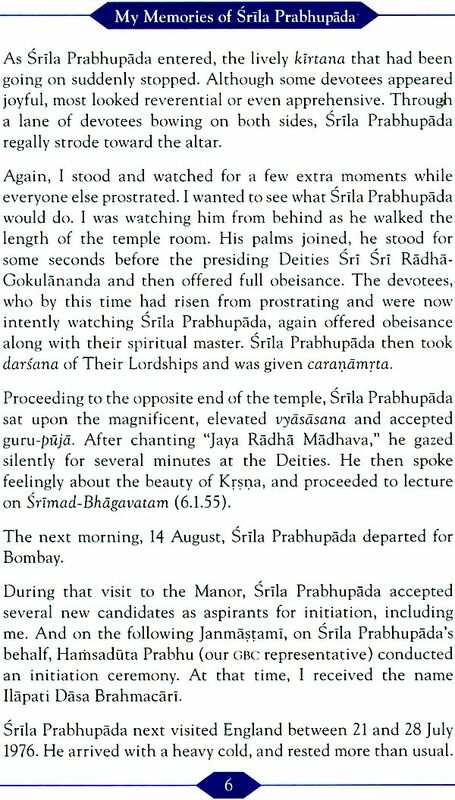 of course, we got to see Srila Prabhupada in Classes and darsanas, during which he freely gave his personal association to everyone. 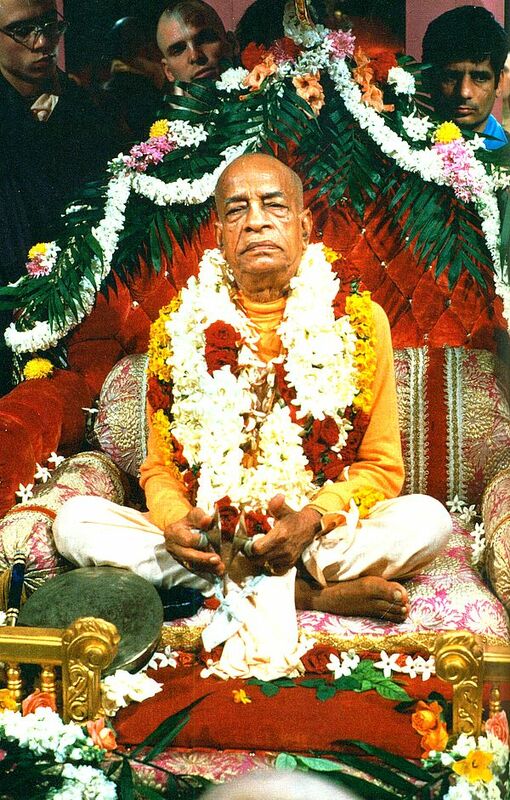 Although I saw Srila Prabhupada several times before he passed away (on 14 november 1977), only once was I ever alone in a room with him –when he gave me the Gayatri Mantra. 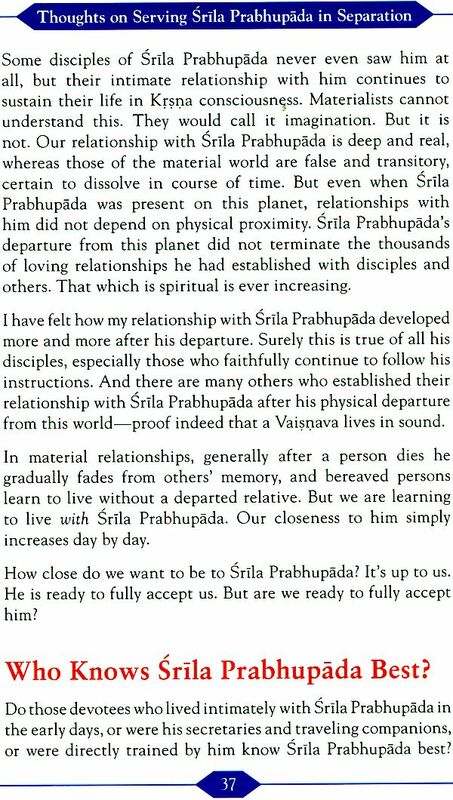 It may be questioned why one with so few memories of Srila Prabhupada would bother to publish them. 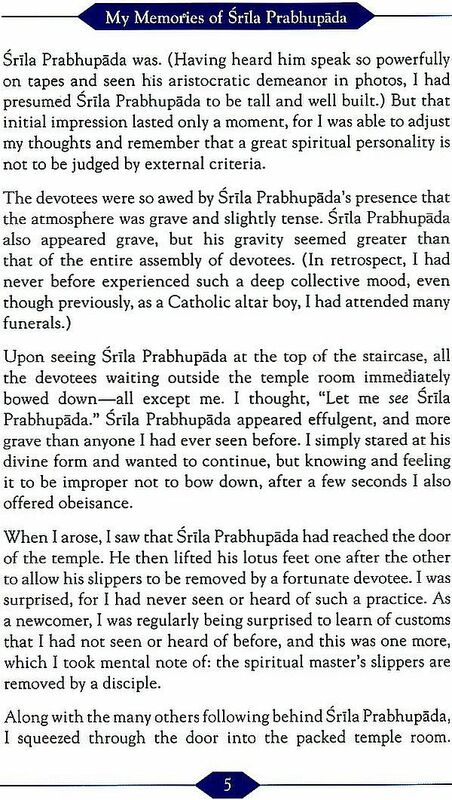 The first reason is that many never devotees ask me about my experiences with Srila Prabhupada, and I wish to share whatever little I can tell with those who are eager to hear. Furthermore naturally have special meaning for me, they are also significant for the entire world, because everything and hence should be recorded and preserved, as far as possible. So another reason for my publishing these few vignettes is to encourage others to write or otherwise record theirs. 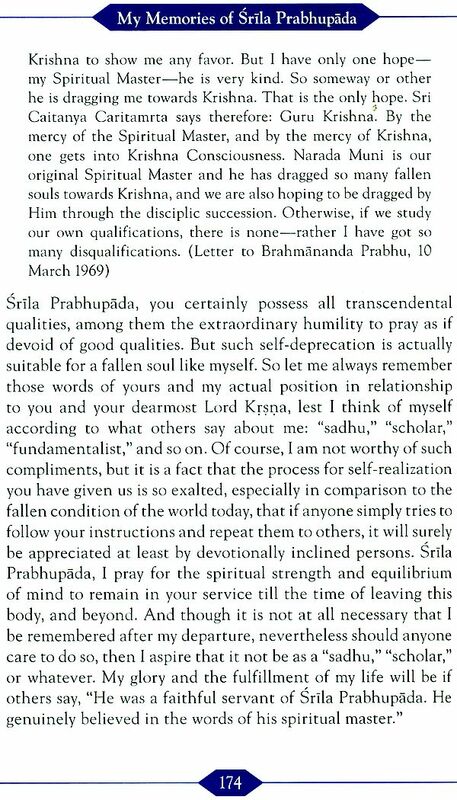 Many disciples had extensive association with Srila Prabhupada, others had less, and still others (as in my case) had very little. But if many of the devotees with only a few remembrances were to publish them, the world would then have a vast treasure of informative, instructive, and enlivening narratives-a significant record for posterity. In the early days of ISKON most devotees were absorbed in a variety of services, and record-keeping was practically the last thing on anyone’s mind. 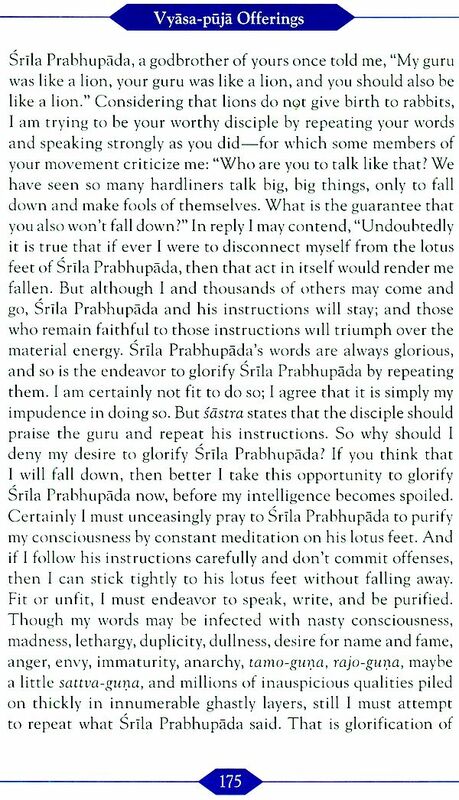 (Hari Sauri prabhu, having the foresight to keep notes, was an exception. No one else possesses such extensive, coherent, and historically reliable records of their association with Srila Prabhupada). Therefor, in recalling the following incidents twenty years after they occurred, despite attempting to retain historical and chronological accuracy, I must admit that within my mind the particulars of srila prabhupada’s visits to England in 1975 and 1976 have become conflated, and hence these accounts may be considered a personal meditation rather than authoritative history. 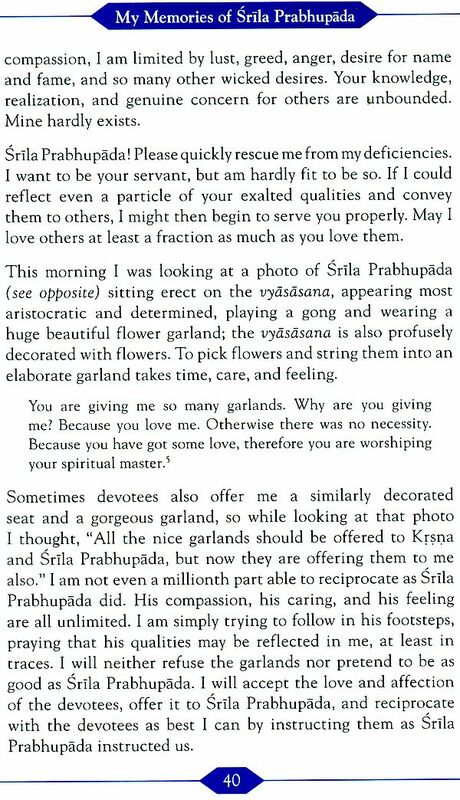 All glories to his Divine Gracee Srila Prabhupada! Proofreading—Kisora Dãsa and Ananta-sarovara DãsI, Indirasakh i Devi Dasi, Murari Dasa, Prana-vallabhi DevI Dãsi, Sridhara Srinivasa Dasa, Sri Giridhari Dasa. 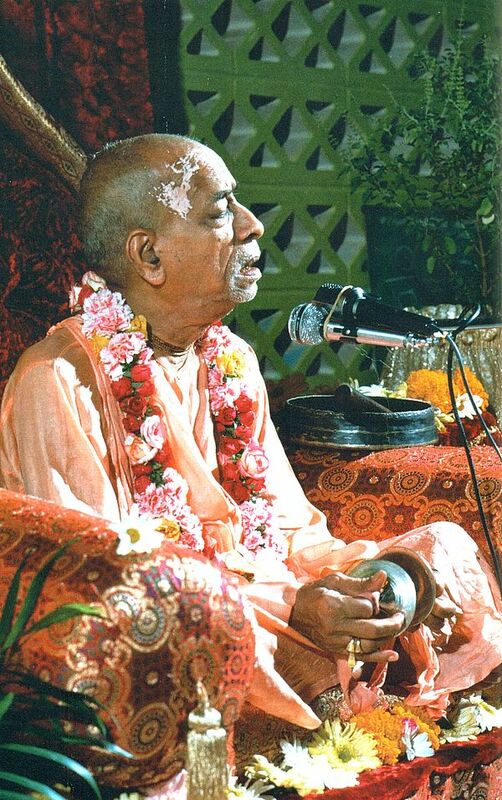 From 1977 to 1979 Ilapati Dasa was based in India, mainly distributing Srila Prabhupada’s books throughout West Bengal. In the following ten years, he helped pioneer ISKCON activities in Bangladesh, Malaysia, Myanmar, and Thailand. In 1989 Ilapati Dãsa accepted the order of sannyasa, receiving the name Bhakti Vikasa Swami, and again made his base in India. Since then he has been preaching Kria consciousness mostly throughout the subcontinent— lecturing in English, Hindi, and Bengali—but also for a few months each year in other parts of the world, His television lectures in Hindi have reached millions worldwide. 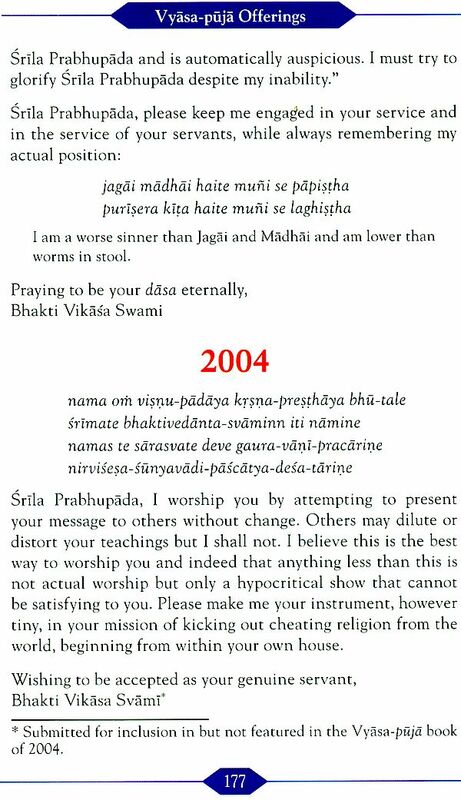 Bhakti Vikasa Swami writes extensively on Krsiia conscious topics. His books have been translated into over twenty languages, with over a million in print.